The Dead Parrot – or, rather, not at all. I squeeze into the back. It’s not a problem but A (F’s friend) and F are already in. We drive on to go to the restaurant. As we’re driving up the road to go to the restaurant, I notice a movement. Now, a lot of Taxi drivers like to fill the front of their car with stuff. After all, it is their ‘office’ I suppose. And so there are things that make them more comfortable. However, I am shocked to see that, perched on the dashboard, just to the right of the wheel, is a parrot! Yes, you read it correctly. 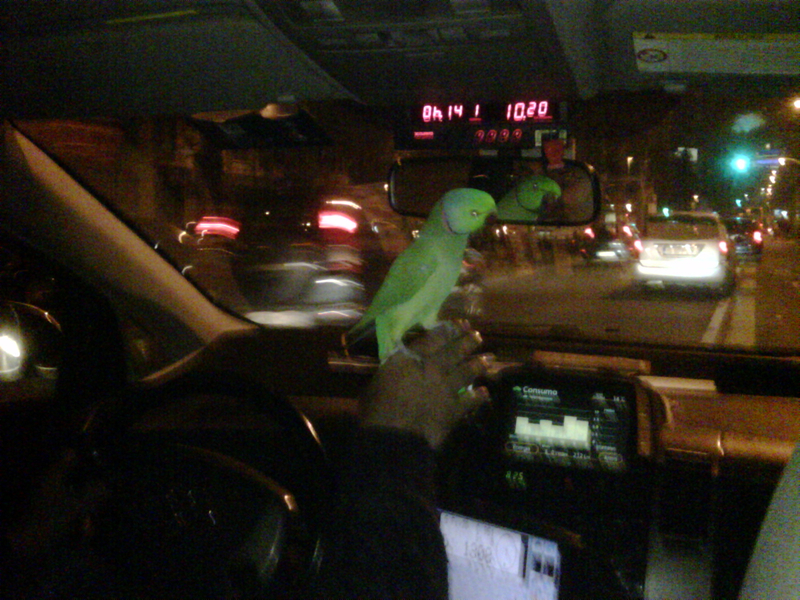 On his dashboard is a living, breathing parrot! We took photos of it. It got angry (so the man said) and started squawking so we stopped using our flashes. Obviously it’s not a good picture but, nonetheless, it’s proof. It was just so funny. The parrot’s name is Gilda. Unfortunately, after he gave it the name he found out it was a male parrot and not a female parrot, which makes it funnier still. An unusual thing to see in the taxi. Keep your eye out, should you be in Milan and taking a taxi. Maybe, you too will share a journey with Gilda! Anyway, Gilda is very nice. I’m not sure he likes his life though. He should be free to fly poor parrot. I’m not sure he does either. But, I guess, as a pet, it would be difficult for him in the ‘wild’ now. At least he has company all day. Someone said, today, that it can’t possibly be legal and, having thought about it, I am sure it must be illegal. However, it was another one of those weird things you find from time to time.